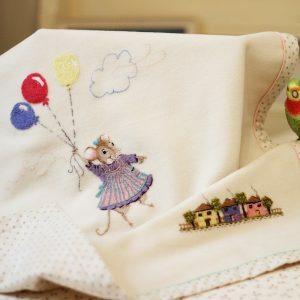 The Blanche kit comes complete with pre-printed linen, threads, Pellon, piping, buttons, surround & backing fabric, lining, needles and step by step instructions. The design measures 9” (23c.m.) high by 11” (28c.m.) wide and is pre-printed on linen measuring 45c.m. square. The completed cushion including the surround measures approx. 50c.m. square. All of the elements within the cushion match perfectly creating a cushion you will be proud to have on display in your favourite room. ’Christmas Candles’ hanging decoration – 4 different candle designs to choose from. 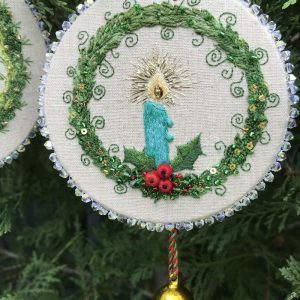 Each kit has all of the contents to stitch and make up one complete hanging decoration. The ‘Happy Clouds’ threadpainting kit includes the pre-printed cashmere (75 x 60 c.m. ), Threads & Needles and instructions to stitch the design. The pattern is printed onto the cashmere for your convenience so you can begin stitching straight away – no need to spend time transfering the design. The Jam Jars Design consists of a selection of glass jars each holding a different flower arrangement in varying depths of water. The linen background provides an ideal medium to show off the flowers as well as the stems within the jar. The project has been designed as a useful wallet to house all of your sewing machine needles with the transparent compartments making it easy to identify each type of needle at a glance. The ‘Jam Jars’ project is quick and fun to create and construct. 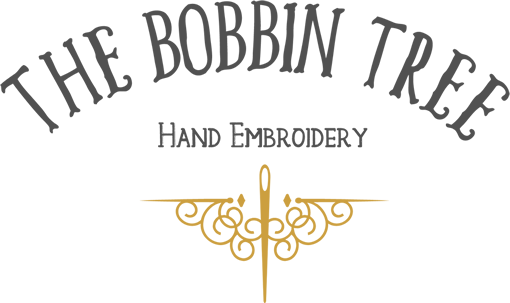 The kit includes all items required to stitch and construct one complete wallet including linen with pre Printed Design, threads, lining fabric, fleecy Pellon, plastic strips, edging bias, Cord, instructions and needles. The folded wallet measures 25 x 11cm (10” x 4.5”) with the overall wallet being 3 times that size when folded out. 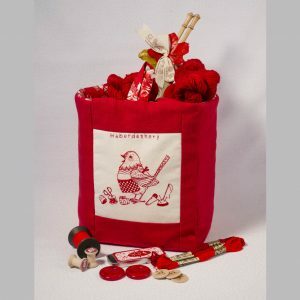 ’Ruby’, the haberdashery bird is a quick and easy design to stitch and turn into a practical item such as a library bag, pouch, pin cushion top or inserted into a quilt. this little fellow is busy picking apples and putting the in his little string bag. Apple pie for tea. This exotic dilly bag is the newest addition to Jenny’s highly popular ‘Arabian Nights’ series. 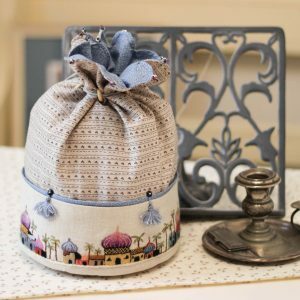 Perfect for storing stitching supplies, jewellery, or any kind of treasuered items, this delightful bag features a sweeping scene of a simple yet contemporary embroidered Arabian cityscape and palms. Embellished with tassels for texture, a rich golden toggle closure, and a scalloped edge top adorned with midnight blue crystals. 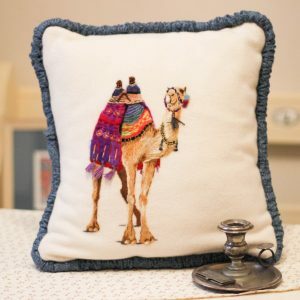 The Sheikhs Camel is a brand new design from the popular series of camels, first featured in Inspirations magazine. This design features a portrait of a single camel, proudly walking through the sand dunes, dressed in blankets of regal finery. 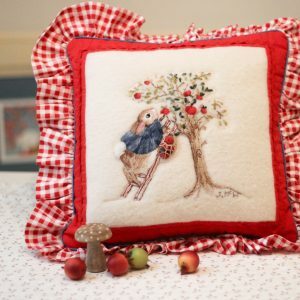 Incorporating a new technique of embellished wool-felting, Jenny’s thread painted marvel can be embroidered as a stunning cushion for your lounge room or bed room. 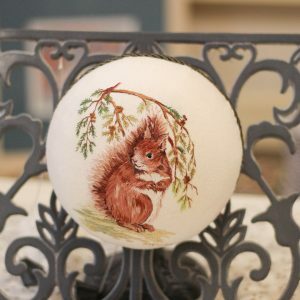 This small squirrel nestled against the ferns makes an ideal thread painted keepsake for yourself or even to give as a gift. Design measures 11cm x 11cm. 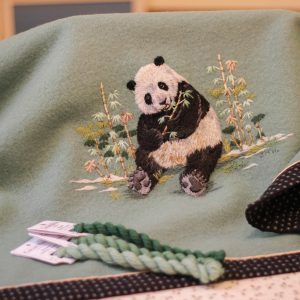 This design captures a lifelike Chinese panda relaxing by the bamboo. ‘Bamboo the Panda’ has been designed for beginners. 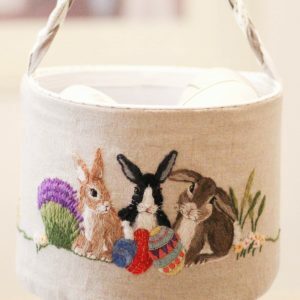 He is worked in thicker ply wool and therefore is quite a quick project using simple yet effective stitches. 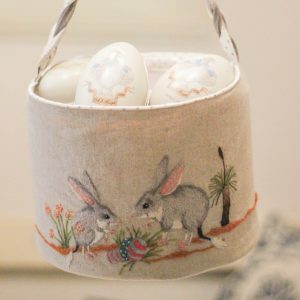 The Easter Egg Bucket comes in two different designs – Bilby or Bunny (Click HERE for the bunny) and each is available in Kit form. 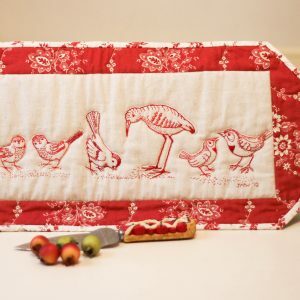 This delightful table runner features a chirpy flock of featherd friends. 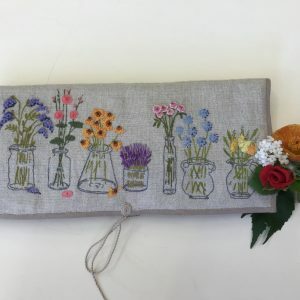 Stitched in Jenny’s unique style of redwork with a contemporary twist, this table runner is a simple yet vibrant project that is suitable for both beginners & experioenced stitchers alike. 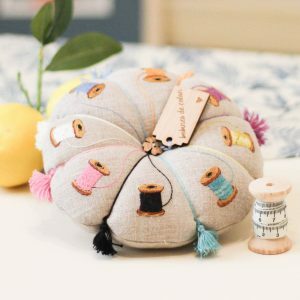 Bobbins Galore is a cheery and colourful pin cushion, certain to assure you’re needles and pins are stored safely. featuring 8 colourful bobbin reels with co-ordinating coloured tassels, this unique and contemporary design is embroidered in high quality embroidery threads on a gorgeous oatmeal linen. 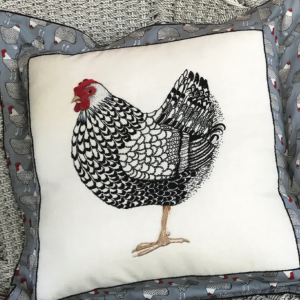 The cushion features a timeless and classic scalloped edge, topped off by a vintage-style button center-piece at both the top and base of the cushion. 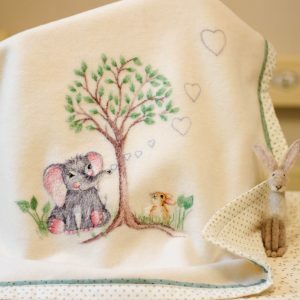 The kit is available in either Bunny or Bilby Design (click HERE for Bilby).